On an alternate world, Superman has become a rogue villain and it’s up to Batman to stop him. However, after having his arm slicied off there is little that Batman can do against Superman, unless he uses the Doomsday protocols that will give him the strength and power needed to destroy Superman. But once Superman has been killed, what other target is there? The origin story of this alternate Batman presented here is compelling although I grow tired of reading stories about Superman becoming evil and the threat he represents to Earth. It has been done in movies, cartoons, comics, games, and probably novels! This story needs to stop being told. The whole point here is that Batman becomes Doomsday and so can fight and kill Superman. 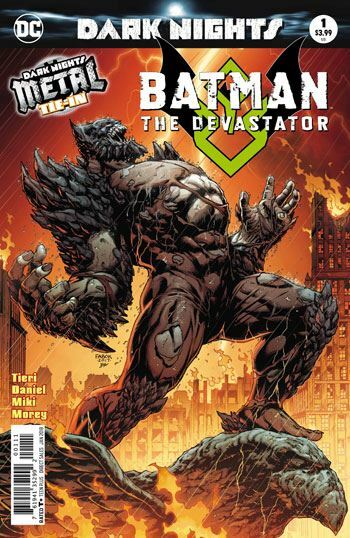 Now, this horrific version of Batman has arrived to Earth 0, the main one in the DC universe and is ready to destroy the Superman of our world too. The focus is on Lois and a version of Bruce Wayne who feels responsible for Lois’s well-being. The tension between them is good and I like how once again, Lois’s first impulse was to protect her son. Fans of Tony S. Daniel will be happy here as Bruce Wayne looks very familiar and the action never stops in this comic. I also like his depiction of Doomsday-like characters which is dirtier and more wart-laden than usual.